The first regatta of the season is scheduled for Friday Nov 30, 2018. Per JD, usual location will be best ice in Minnesota. We have been sailing on ice since Nov 16. Many lakes up north are now thick enough. We now have a beautiful new freeze of Battle Lake, just north of our usual Christina near Ashby, Mn. A number of lakes closer to Minneapolis should come thru in the next week. Very little snow predicted in our regatta locations. Time to sharpen runners and check your equipment. 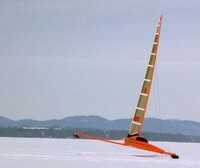 Watch this site or Facebook Minnesota Iceboaters for updates.